RAF Air Diagram 5187. 'Mk.1 Ejection Seats Danger Points And Rescue Procedure'. Printed for H.M. Stationary Office by Jarrold & Sons Ltd., Norwich. Prepared for the Ministry of Supply for promulgation by the Air Ministry. Issue 1, sheet 1 of 1, dated May 1951. Paper, approximately 100 x 75cm. 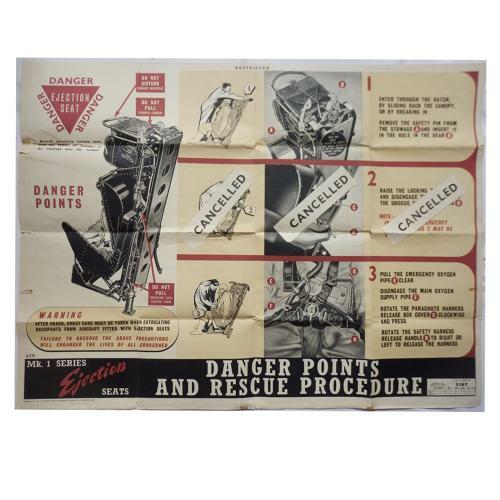 Illustrates the danger points on an ejector seat and gives information on extricating occupants from aircraft fitted with them following a crash. Folded. Has tears/damage on the folds and some edge tears/minor loss. Some of these have been strengthened with acid free archival tape to the rear. Three large "Cancelled' strips have been glued on to three of the images (offiically). A great looking poster. Stock code P23184.